In todays world repressive regime are having difficulty to continue their reign! The situation in Iran is unbearable for those who are using their private car as TAXI to be able to live the harsh life in IRAN.For example the teachers income is not enough and therefore they have to work second or third job and sometimes by using their car as taxi . The crisis of Gas has caused uneasiness among hard working people who have enough headach already in Iran and this might escalate unrest among all sector of Iranian society. Columnist Ahmad Zeidabadi in Iran has described the situation as: " People have attacked Gas stations like famin-stricken and have burnt them with anger. At the same time some officials are talking about Khatami's shaking hands with an Italian woman ( According to those officials belief , the clergies should not shake hands with women) and another isue which has been continued by Ahmadinejad's government is to stop or arrest women not following the regims dress code in the Streets.Ahmadinejad also have said with certain that the absent Imam's appearance is imminent" ( 12th imam of Shiite ). Above all , the differences among officials in the Islamic Republic is also growing sharply in a way that they openly speak out against each other and against Ahmadinejad's government. Child abuses by parents in Afghanistan, Iran and Middle needs more attention by UN and other human rights organizations. threats of violence, imprisonment, or harassment. to Protect Journalists has documented over the past six years. journalists who flees ever returns home. seek to silence the press," Simon said. within their countries did not bring an end to the threats. regional and international press freedom organizations, including CPJ. countries of refuge in the CPJ survey. neighboring countries, in many cases unable or not permitted to find work. camps or report them to officials in their home countries. requiring a lower level of skills. experiences and to keep the spotlight on mistreatment of the press. Karen Phillips is the Journalist Assistance Program Associate. Ms. Shadi Sadr ( Lawyer) in speaking with Rooz online: Tomorrow a woman and man at 9:00am will be stonned to death in takestan ( Opposit to "Beheshte Zahra" ). Latest news indicate that : A few bloggers are asking other bloggers and people to go to Takestan where the stonning is going to take place and help stop this barbaric act . The stonning will take place on Thursday. (New York, June 20, 2007) – The Iranian Judiciary should immediately stop the scheduled stoning tomorrow of a woman and man charged with adultery, Human Rights Watch said today. Their executions are scheduled to take place on Thursday at 9 a.m. in a public square in Takistan, a town in the north-central province of Ghazvin. The Ghazvin Municipal Security Council has publicly announced that Mokarrameh Ebrahimi, 43, and the father of her 11-year-old child are to be executed by public stoning. Branch 1 of Takistan’s Criminal Court sentenced the two to death by stoning on charges of adultery. Ebrahimi, a mother of three children, has been awaiting her death sentence in the Choubin prison in Ghazvin province for the last 11 years. The man with whom she was accused of having had “illegal relations” has also been in prison during this time. Human Rights Watch opposes the death penalty in all circumstances because of its inherent cruelty. In December 2002, Ayatollah Mahmud Hashemi Shahrudi, the head of Iran’s Judiciary, ordered a ban on stoning. Yet this form of punishment continues, and it is disproportionately applied to women. In response to this, Iranian women’s rights activists initiated the Campaign to End Stoning Forever to document and prevent the practice throughout Iran. Nine students of Mazanderan University are summoned to the "Disciplinary Committee"! Mr. Bijan Sabagh one of the student activist have reported this news and said: Mr. Milad Moeini , Ms. Marzieh Shafiei , Mr. Arash Pakzad , Ms. Sara Khademi and Mr. Sadegh Hakimzadeh together with three other students who do not like to be identified are summoned to the Disciplinary Committee. He added: These students are charged with participating in the Mazanderan University students gathering. Back story: There were student protest in University of Mazanderan at the end of March and 15 students of this university were detained . (London, June 19, 2007) – Iran should immediately halt the mass deportations of Afghan nationals and investigate allegations that its authorities have abused numerous deportees, Human Rights Watch said today. Iran should also ensure that Afghans faced with deportation are given the individual opportunity to seek protection based on conditions in Afghanistan that would threaten their lives or freedom, Human Rights Watch said. Since late April, the Iranian government has forcibly deported back to Afghanistan nearly 100,000 registered and unregistered Afghans living and working in Iran. The Iranian government says the mass deportation is aimed at reducing the number of illegal immigrants in the country, but Iranian officials have also expelled Afghans who have been registered with the authorities, many of whom have been regarded as refugees (panahandegan) for many years. Iran announced in 2006 that it would “voluntarily repatriate” all of the more than 1 million Afghans remaining in Iran by March 2008, saying that none of those people are refugees. In February 2007, the Iranian government told the Afghan government and the United Nations that it intended to regularize foreign migrants on its soil, and that it would deport en masse undocumented Afghans starting on April 21, 2007. On April 23, 2007, the Iranian authorities made good on their announcement when they deported more than 4,000 Afghans through border crossings with western Afghanistan. However, the Iranian authorities did not give advance notice to many of the nearly 100,000 Afghans deported in the past 50 days that they would be expelled from Iran. Many of the deported Afghans were separated from their families and had little time to collect their possessions or wages. According to the Afghan Independent Human Rights Commission (AIHRC), more than 40 percent of the deportees, most of them children, were separated from their families after their apprehension. Nearly all of the recently returned Afghans were forced by the Iranian authorities to pay for their transportation to the Afghan border, sometimes at extraordinary cost. According to the AIHRC, nearly 3,000 Afghan deportees said Iranian authorities beat them before reaching Afghanistan. The AIHRC also reported that Iranian authorities are responsible for the deaths of at least six Afghans. The Iranian police killed one man when they threw him out of a window while apprehending him. Five other Afghans died in Afghan hospitals after being deported as a result of injuries inflicted by Iranian police. According to accounts gathered by Human Rights Watch, the Iranian authorities are transferring thousands of Afghans to three holding facilities near the Iranian-Afghan border before deporting them to Afghanistan. The three facilities known as Askarabad, Sang-e Safid, and Tal-e Seeya, which is also known as the “Black Dungeon,” are all veritable prisons. Recent deportees have told Human Rights Watch that the Iranian authorities routinely beat Afghans in these locations and force them to pay for their own food and water. According the AIHRC, Afghans spend between one and 19 days in these facilities before the authorities deport them back to Afghanistan. Not all of the Afghans that went through these facilities were unregistered. For example, Mehdi, an 18-year-old Afghan, and his family were registered and legally residing in Iran. In late April, Mehdi and his family were voluntarily returning to Afghanistan when the Iranian authorities apprehended them. Human Rights Watch called on Iran to immediately investigate abuses in these facilities and to hold to account those responsible for violating the rights of Afghans in the course of apprehension, detention and deportation. The government should ensure that repatriation efforts do not result in separation of families, especially separation of children from their parents. In addition, advance notice of intent to deport should be given to the deportees to enable them to put their affairs in order. Human Rights Watch is particularly concerned that Afghans in need of international protection be given the opportunity to seek it in Iran. This includes both long-term Afghan residents registered by the authorities as well as newer arrivals who may have asylum claims but who have not been allowed to register at all. In all cases, Iran should strictly abide by its obligations as a party to the 1951 Refugee Convention not to return any person whose life or freedom would be threatened in Afghanistan. Human Rights Watch called upon the UNHCR to refrain from any cooperation in the government’s repatriation program if Afghan nationals in Iran – whether registered or unregistered – are not given the opportunity to make asylum claims. Finally, Human Rights Watch called upon the UNHCR to monitor conditions in the Askarabad, Sang-e Safid, and Tal-e Seeya facilities, to see if potential refugees there are being coerced to return to unsafe conditions, and to hear potential asylum claims. To protest on Ahmadinejad's Government dealing with universities: Minority MP's in the parliament have supported students! The support from hundereds of students from Amir Kabir University for eight imprisoned students brought reactions from Minority MP's in the parliament against Minister of Information and Minister of Science ( Minister in charge of universities). The minority MP's in the parliament: If the Minister of Science and Minister of Information won't follow the notices issued by the MP's , we will use legal and other channels against them. The MP's have said: Students have told us things that shows actions that are taken against them were in contrary with law and therefore the MP's are asking the Ministers to work in accordance with law. 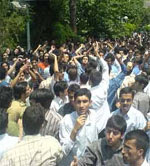 Student activists are the target of Ahmadinejad Government. And in recent months many students from all over Iran have been summoned , arrested , jailed or even expelled from universities. and this brought reaction from families, students and now the Minority MP's . $150,000 for those who would kill Salman Rushdie ! After Queen of England have decorated Salman Rushdie the writer of "The Satanic Verses" with Cavalier , the headquarter which protect the World Islamic Martyrs has chosen $150,000 award for those who would execute Khomeini's "Fatwa" against Salman Rushdie and kill him. Mr. Frouz Rajaie-far the general director of this headquarter have announced this news and said : On 2004 this headquarter have announced $100,000 award for those who successfuly kill Salman Rushdie. He then called Queen's action as an anti Islamic and told : Since Khomeini's Fatwa Salman Rushdie have lived 19 years with nightmare. 1200 students of Amir Kabir University : We won't participate in the exame if our fellow classmates are still in the jail. The students have signed a petition to postpon the exame until the freedom of their classmates. According to ILNA the petition which has more than 1000 signature has demanded for the release of their classmates and dismantlement of all sentencing against students deprived from continuing their education. Although the unoccupied chairs in the class are few but it shows these are the oppressed students who have called for our rights and are in prison because of that. Mr. Molaei the lawyer for the following three imprisoned students ( Mr. Hosain Tarkashvand, Mr. Nariman Mostafavi and Mr. Naser Poyafar ) in speaking with ILNA have said: There is no sentencing for my clients yet and that means my clients are still under interrogation . trial or the announcement of the court's verdict. "We are dismayed by these sentences," the press freedom organisation said. on 22 May. Her newspaper has been closed since 2005.
toumen (approx. 85,000 euros) in bail. of the world's 34 worst press freedom predators. The information contained in this update is the sole responsibility of RSF. In citing this material for broadcast or publication, please credit RSF. Iran, one of the world's ancient civilizations is today the 18th largest country worldwide. With its population of approx. 70 Mio. Iran is a nation between tradition and modernity. This country is anything but a homogenous society, neither ethnically nor religiously. The divide between rich and poor is another aspect. Students continue to fight the repressive regime of Ahmadinejad! Mr. Ashkan Arshian member of the Islamic Student Association of Mashhad University met Ayatollah Saneei and complained about the closure of student publication and the arrest of students. Ashkan beleive: distribution of fake student publication in other universities particularly in Amirkabir University aims to defame student movement and to bring the student movement to its closure. He then added: Last week again we witnessed the arrest of two Mashhad University students. Last wednesday several plain cloth agents attended to Mr. Ali Saberi and Mr. Abbas Hakimzadeh's home and arrested them and took away their personal belonging including computer. Mr. Arshan demanded for clarification in these two cases. and asked who have arrested them and where they have been transfered. TEHERAN - An Iranian court has sentenced two journalists who covered banned protest rallies in a Kurdish area to up to three years in jail, their lawyer was quoted as saying on Sunday. The court in the town of Sanandaj in northwestern Kurdistan province jailed Jalal Ghavami for three years and Saeed Saedi to two and a half years for attending two illegal rallies in 2005 in front of the governor’s office, ISNA news agency reported. The verdict said they had been ‘acting against the system and national security by participating in illegal gatherings ... (and) propaganda activity against the system,’ ISNA said. 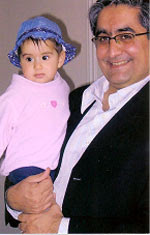 Ghavami was also sentenced for ‘insulting’ officials. But their lawyer Nemat Ahmadi said his clients only went to the demonstrations to report on them, ISNA said, without specifying which media they worked for. ‘My clients attended the gatherings as reporters and just for reporting,’ Ahmadi said. Last month, the court in Sanandaj sentenced a woman activist to six years in jail for attending the same two banned protests. In an appeal about their cases last year, Amnesty International said Saedi and Ghavami were arrested in August, 2005, after they helped organise a rally against the killing of a Kurdish man that sparked protests in Iranian Kurdistan. ‘If imprisoned, Amnesty International believes both men would be prisoners of conscience, imprisoned solely for peacefully exercising their rights to freedom of expression, assembly and movement,’ the London-based group said in July. Rights groups often complain that Iran jails pro-reform writers, activists, journalists and intellectuals without due legal process. Iran routinely dismisses accusations that it violates human rights. Iran’s 70 million population includes about 6 million Kurds, many of whom live in the mountainous northwest bordering Iraq and Turkey. Kurdish leaders in Iran have in the past complained of discriminatory treatment of their people. A Law Not Enforced is Good for Libraries, Detained Journalist’s Mother Tells Rooz! Today more than before the voice on focusing for Human Rights and Democracy movement in the Middle East is becoming louder & stronger. Liberalization of Middle East is also the option of Middle Eastern to mobilize the masses against old political vision and corrupted state officials. The Middle Eastern are restructure their thought to come with new mission and vission and help build a society not for revolution but evolution . 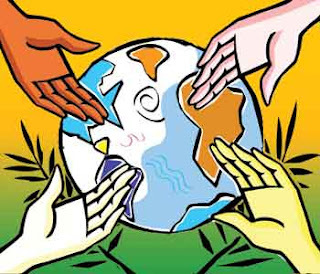 Universal Declaration of Human Rights is becoming the centre of their struggle against corrupted political officials.By knowing the experience of Iran a secular society ( separation of religion with state ) is what Middle Eastern look for. To build a liberal democratic or social democratic society take time and nothing comes easy. Reformation of society and reform in current political system is what Middle Eastern want. which Iran is a signatory. journalists and human rights activists in Kurdish Iran. representative for Iran in your country. Please contact this office if sending appeals after 21 June 2007. A Trans Filtering Network which was started from March this year is being tested and will soon be working in Iran. This network which is working with vigilant robots will block even those blog or website that have a filtered site in their text. The interesting point is that the communication officials has chosen " National Filtering Network " for this new filtering systm . An official from " Sherkate Ertebatate Novin " which does the filtering of internet weblog and websites in the country have told to "Mehr" reporter : I'm going to give you a news which was not announced before and that is the operation of a Trans Filtering Network in the country. TFN will be working under the supervision of Irans' communication Company " Sherkate Mokhaberate Iran ". This official added: "The inteligent robots will read the content of all the sites and will mark those words it has already in its memory and if those words exceed from the authorised one then the website will be blocked. For example if a website give link to BBC- farsi that site will also be closed."